Believe it or not, this is actually a hotly contested question. 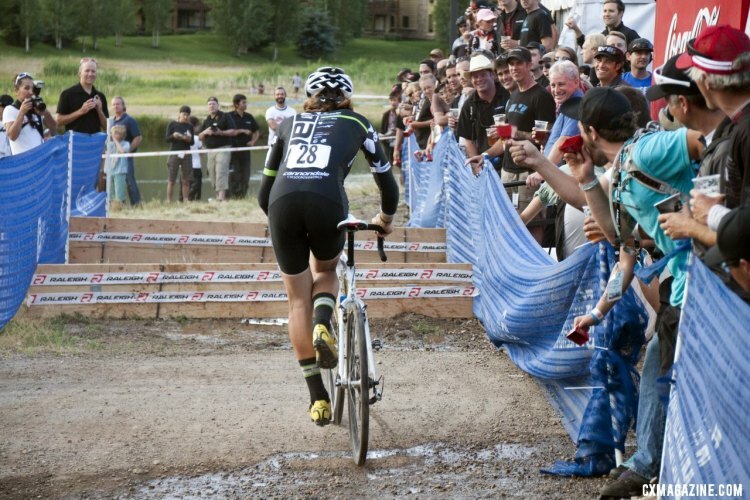 Many top-level racers, like Jeremy Powers and Adam Myerson, have completely abandoned the step-through method (also referred to as step-thru). Instead, after they swing their unclipped foot over the saddle, they leave it behind their clipped foot. Moments before they arrive to the first barrier, they unclip their leading foot, and usually plant that one first. 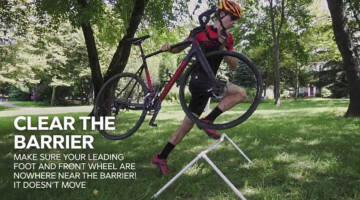 In the last few years, many new riders to the sport have been taught this newer method as if it is the only way to dismount. As a disclaimer, many of the folks here at Cyclocross Magazine, myself included, originally trained with the earlier step-through method. In this case, the rider swings their leg around and sneaks it forward between the clipped in foot and the frame. This foot will eventually touch the ground first, just after the rider unclips their back foot. Years ago, step-through dismounting was the dominate method, and was used in almost every dismounting situation, no matter the conditions or placement of the barriers or obstacles. 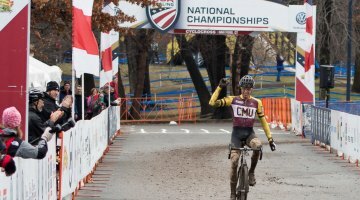 I started racing cyclocross on a mountain bike with a sloping top-tube, and I figured out I could unclip my right foot and idiotically pull it over the top tube instead of swinging it around behind me. I don’t recommend this in any situation, because you are forced to extend your arms and contort your body in such a way that gives you no proper control of your bike at speed. 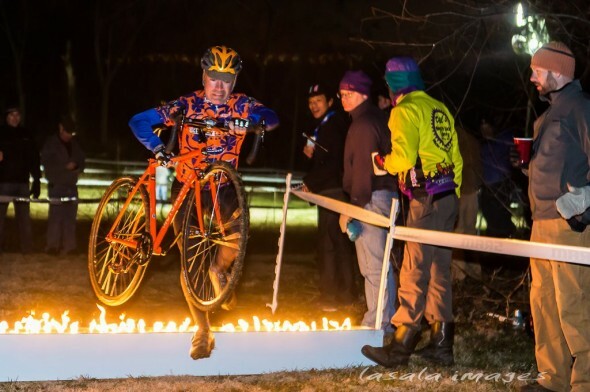 When I bought a ’cross bike, and learned to dismount by swinging my leg behind my saddle, I felt more comfortable stepping-thru simply because my unclipped foot usually was in front in years past. In the end, even if you are comfortable using this method, you should look at stepping-thru from a risk vs. reward standpoint. What are the risks? In the new method, when your clipped-in foot is in front, your hip, leg, and ankle are positioned perfectly for clean and quick unclipping. When your unclipped foot is forward, your hip is open and facing away from your bike, forcing you to exaggerate the movement in your ankle to unclip your remaining foot. 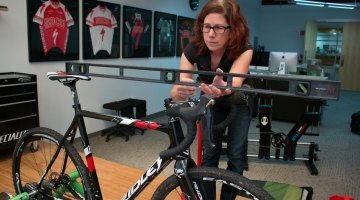 Pressing your right hand on the top tube of your frame and putting your weight on this arm (which takes the pressure off the remaining clipped-in foot) is one of the best ways to help unclip your left foot when stepping-thru. However, if you are unable to unclip your back foot, the results can be disastrous. At slow speeds, this usually results in hopping with your unclipped foot as you drag the rest of your bike behind you with your still clipped-in foot. At fast speeds, the inability to unclip could mean really getting hurt by running into a barrier or tumbling forward. What are the rewards? When a rider is stepping-thru, and the first foot to hit the ground is already in position for a long stride, the rider is better prepared for sprinting forward over the barriers or obstacles at higher speeds. Another advantage, brought to my attention by our chief cowbell ringer, Andrew Yee, is that the landing foot in the step-through method is consistently pointed forward in a position that puts less stress on his knees during the high-load first step. The takeaway: If you are still familiarizing yourself with clipping in and out of your pedals, or you don’t run with a long stride, there is little reason to add stepping-thru to your quiver of skills. Besides, most course designers these days place their barriers uphill or after a sharp turn. Not only do such designs eliminate any possible gains of stepping-thru because riders are already moving at slow speeds, but they also create a circumstance where the rider is unprepared to lift the pressure off the unclipped cleat. In those cases, the risk far outweighs the non-existent rewards. Every so often, though, a rider might find a set of barriers on a nice, flat stretch of grass, when stepping-thru could mean precious seconds. On the other side of the argument, we are only talking about a matter of seconds, and over a 45 minute race, that might add up to ten to fifteen seconds. That could be precious time to beat that guy or gal who usually dominates you in the sprint to the finish. Then again, stepping-thru won’t suddenly be sending you to the front of the pack if you’re used to seeing your name near the bottom of the results. So is it worth the risk? Like bunny hopping, stepping-thru should be thoroughly practiced until you are comfortable with it in every situation, and that includes performing them with your heart beating at 180 bpm. It is certainly not something to try for the first time during race day. The half-hearted attempt with real barriers is usually the time when an accident happens. 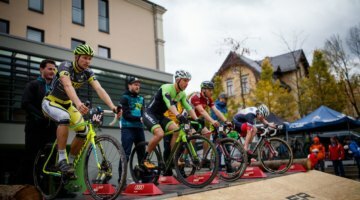 If you are pressed to find pre-season training time, there are better skills to practice that will help you in all cyclocross races, like driving a bike, cornering, or figuring out how to stay in the pain cave for 45 minutes. But if you feel like everything is up to snuff and want to try something more old school, I suggest you find a nice, soft field of grass and start slow! 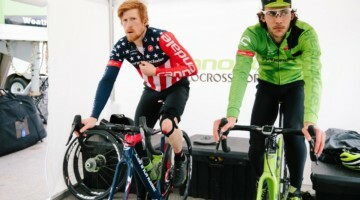 Get schooled in cyclocross with our Cyclocross Academy class list here, and make sure you’re subscribed to Cyclocross Magazine, your guide for getting into the sport, and upping your ’cross knowledge. Not subscribed yet? Our Issue 22 has a story on how to get into racing and what to expect during race day. Learn both and use either depending on the situation. Completely agree with you Chris Cru Jones! Perfect way to put it. Adam preaches learning one and only one method. You never have to think about which to use and you pratice it until you can’t do it wrong. BTW, Adam also unclips his left foot even before he brings his right foot over. Since their doing it I’m doing it… Lol naw you have to do what works best for the person! Find your advantage. I do what Adam does. Works like a charm! 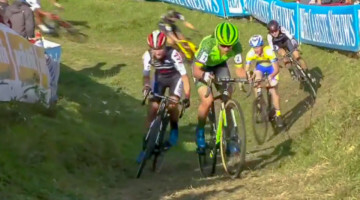 If you watch the European pro cx races (and I’m sure you do) closely you’ll see that almost no pro racers use the “step through” anymore. I saw just one pro using the method last winter. I can’t remember who it was. Put in some high speed barriers and you’ll see them stepping through. In fact, just bring back the barriers! I’ve always thought that was the most awakward way to dismount a bike. This is an old pic! find a pic of her in a rabo kit on a disc tcx. Mike Clark, she never wears a Rabo kit…since she’s always in a WC jersey except at Worlds, where she’s riding a Dutch jersey. First-in-the-world problems. I’m not sure what you’re getting at, her wc kit still says rabobank on it. she hasn’t raced for koga in almost a decade. I’m just curious if she still dismounts like this. I learned from one of the best: Erik Tonkin. Step through is the way to do it. I agree with Mike here, the European Pro’s mostly do not step thru. I can’t answer why they do not, because I am pritty sure the could do it, but I can explain why I do not (also trained for step thru): You need more time to get into the position and you must hold it a bit longer (which is not the most comfortable one). This means you are rolling more passive in a less stable position, but with strained muscles (core, legs, arms). 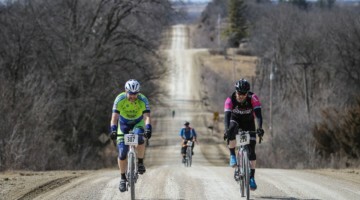 -Step behind is better at the end when I am getting tired because I am resting longer in the saddle, with a vew more pedal strokes and start the dismounting just a half to a full second later. The half step that I only can do when step behind is IMO (and in my position in the peloton) not an issue. Stepping through always felt like it was a matter of time before I got hung up on the bike or my left leg and crashed. The non step through method feels much more natural and smoother to my scrub class racing self.